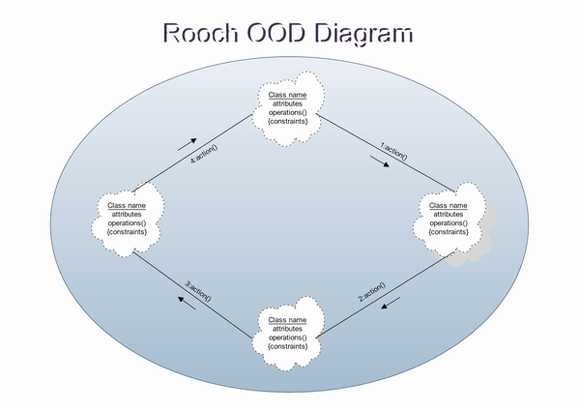 Grady Booch's Object-Oriented Design (OOD), also known as Object-Oriented Analysis and Design (OOAD), is a precursor to the Unified Modeling (UML). 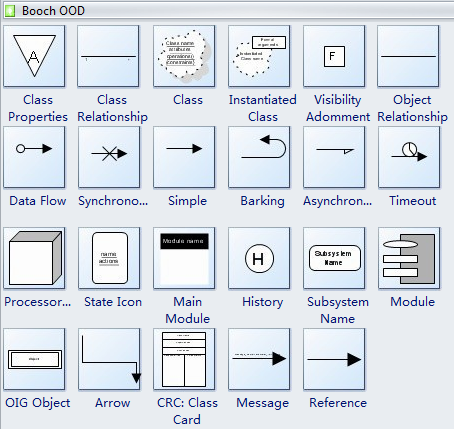 The Booch method includes six types of diagrams: class, object, state transition, interaction, module and process. Edraw is a very easy-to-use and intuitive database design tool. Booch OOD tool can save you hundreds hours of work. It contains special shapes and settings for creating Booch OOD diagrams. In Edraw Professional, the Booch Diagrams template and shapes are in the Software folder. Predefined symbols: The vector stencils library Booch OOD contains specific symbols of the Booch method. Quick-Start Booch OOD Templates: Professionally-designed Booch OOD diagram templates make you instantly productive. Wide Application: More than 200 kinds of diagrams can be made via Edraw diagramming package. Use the Software engineering solution to draw Object-oriented design (OOD) diagrams for your business documents, presentations and websites. Auto-formatting: Edraw can connect, align and distribute shapes automatically. The smart control handles help users make modifications more easily. The preset themes allow 1 click change of color, font, line and fill style. The notation for Booch OOD includes six types of diagrams: class, object, state transition, interaction, module and process. The Booch template supports all of these. Booch's notation is generally regarded as the most complete one for representing object-oriented systems. Unfortunately, the notation is also complex and can lead to fragmented or duplicated information across model diagrams. Booch considers himself more of a developer than a methodologist, so he concentrates more on the results of system analysis and design than its process. He is a major contributor to UML, and has also made his notation a property of the public domain.